In September 2000 147 heads of State and Government, and 189 nations in total, in the United Nations Millennium Declaration [A/RES/55/2] committed themselves to making the right to development a reality for everyone and to freeing the entire human race from want. They acknowledged that progress is based on sustainable economic growth, which must focus on the poor, with human rights at the centre. The objective of the Declaration is to promote "a comprehensive approach and a coordinated strategy, tackling many problems simultaneously across a broad front." The Declaration calls for halving by the year 2015, the number of people who live on less than one dollar a day. This effort also involves finding solutions to hunger, malnutrition and disease, promoting gender equality and the empowerment of women, guaranteeing a basic education for everyone, and supporting the Agenda 21 principles of sustainable development. Direct support from the richer countries, in the form of aid, trade, debt relief and investment is to be provided to help the developing countries. 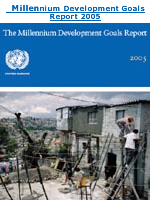 To help track progress, the United Nations Secretariat and the specialized agencies of the UN system, as well as representatives of IMF, the World Bank and OECD defined a set of time-bound and measurable goals and targets for combating poverty, hunger, disease, illiteracy, environmental degradation and discrimination against women [See Road Map towards the Implementation of the United Nations Millennium Declaration (PDF, 450KB)]. International experts also selected relevant indicators to be used to assess progress over the period from 1990 to 2015, when targets are expected to be met. Each year, the Secretary-General will prepare a report on progress achieved towards implementing the Declaration, based on data on the 48 selected indicators, aggregated at global and regional levels. In close collaboration with United Nations agencies and funds, the World Bank, IMF, and OECD, the United Nations Statistics Division coordinates data analysis and maintains the database containing the series related to the selected indicators, as well as other background series intended to supplement the basic 48 Millennium indicators, for more in-depth analysis. The figures presented in the database are from international series compiled by the various agencies. The availability of data necessary to calculate the indicators in each country depends on the capacities of the national statistical services. In many instances-when country data are not available or are affected by serious quality problems- estimates are used. In order to help focus analysis and assessment of progress at the country level, the Millennium indicators and background data series are also organized and presented by country in Millennium country profiles. Country-level monitoring is an indispensable element in assessing progress towards the MDGs and in mobilizing resources to assist developing countries in meeting the targets. The United Nations Development Programme, assisted by other agencies and the United Nations Secretariat, is coordinating efforts and supporting the preparation of national monitoring reports in countries.